Back at the hospital we waited anxiously for a phone call or any news from the other group. After what felt like hours, they came through the front door of the hospital—and they were smiling. I breathed a sigh of relief. They told us that six of the group had managed to make it inside, including four Americans; this was crucial, because up to that point there had been no Americans in the compound. Because the US was Israel's benefactor, protector and ally, having American citizens inside the compound would make it extremely difficult for the Israelis to launch an assault. I had an anxious moment as I tried to find out what had happened to my roommate Nikolaj, a Dane, and nobody seemed to know where he was—but then I finally found someone who verified that he had been among the group that made it inside. I wasn't surprised. Nikolaj was a scout, always full of energy, and he walked twice as fast as anyone else in our group. I'm sure he was the first one to the door. All in all, the action had been a great success. Some of the group headed back to Jerusalem or to houses where they'd been staying in Ramallah, while many of us remained in the hospital overnight. This was not simply a matter of accommodations: the IDF frequently raids hospitals, taking injured men out of their beds or sometimes out of live operating theaters (as I was to learn later from a doctor in Hebron)—just one among a litany of violations of the Fourth Geneva Convention committed on a regular basis in the West Bank and Gaza by the Israeli occupiers. ISM volunteers would frequently stay in hospitals to attempt to stop this from happening, or failing that to at least act as witnesses. We were placed in two rooms and given mats and blankets to spread on the floor. We were also given a dinner by the hospital staff, cooked especially for us. I had heard about the graciousness and hospitality of the Palestinians, and now I was experiencing it firsthand. We talked with the hospital orderlies, and they told us some of what had been happening during the Israeli invasion over the past few weeks. One older woman had come to visit the hospital; the cast on her leg was causing her pain, and she could no longer bear it, so she broke the curfew to come and have it looked at. As she left the hospital, leaning on her cane for support, she was shot by an Israeli sniper. She cried out for help, but when the hospital staff tried to go outside to bring her back inside the snipers would fire at them as well, driving them back. They continued trying to help her but the Israelis would not let them reach her, and eventually she bled to death—within a few feet of a hospital entrance. I was disgusted at this story, similar to so many incidents that have been documented by human rights groups for decades in the Occupied Territories. How exactly was this "fighting terror"? Was Israel more secure now that this woman was dead? Another ISM volunteer who had been at the hospital relayed the story of a 23-year old retarded man who had wandered out during curfew just a few days earlier, unarmed, and was shot dead by Israelis. Witnesses saw him running from the Israeli soldiers before he was killed; I wondered if he had even fully understood what was happening. Almost every Palestinian I met during my trip had similar stories to tell, about their fathers, their sisters, their uncles, their cousins, their friends. No one's life was left untouched by the occupation. That evening we sat in our room, having a late night snack of wine and chopped carrots and talking about the events of the day. It was a welcome light moment among mostly dark moments—until someone mentioned that just outside our ground floor window was the parking lot where the hospital had been forced to dig a mass grave. After the Israeli invasion the hospital morgue had been filled beyond its capacity, and the staff had no choice but to bury 15 bodies in a mass grave in an attempt to prevent the spread of disease from the decomposing bodies. One of the people in the grave was a young Palestinian-American woman, Suraida Saleh, born in Washington, DC. She had been shot and killed in her car by the Israelis in the first days of the invasion as she held her baby in her arms. Her husband had been shot as well but he had survived, though a bullet was still lodged in his skull; miraculously, their baby was uninjured, though it had initially appeared to be hurt because it was covered in its mother's blood. I looked out the window into the darkness and I could see the vague outlines of the grave, just a few yards from where we were sitting. The light moment ended; I was quickly discovering that in the Occupied Territories moments of happiness are fleeting, and dark thoughts like these are never far away. One person mentioned that she would be heading to Jenin the next morning and she invited me to come along. It had only been a few days since the Israelis had pulled out of the refugee camp there, and I immediately agreed. This was the one place I most wanted to see for myself. Several other people (two Americans and two Danes) decided to come along as well. With the ISM you were always making new friends and saying goodbye to old ones. The next morning we went out to the parking lot to see the mass grave for ourselves. It was surprisingly small. The people of Ramallah had made it into a makeshift shrine; there were rocks arranged around the periphery, a wooden structure with a Palestinian flag at the center, and sheets of cloth printed with prayers for the dead. We stood at this makeshift tomb in silence. A friend and I went to the offices of the Palestinian Non-Governmental Organizations network, or PNGO. Renad Qubbaj, the West Bank director of PNGO, showed us their offices. The IDF had broken the door down, and there were papers thrown all over the floor. Desks had been ransacked, equipment had been destroyed, and hard drives had been removed from computers. She showed us a picture of herself with Dr. Mustafa Barghouti, the president of the Union of Palestinian Medical Relief Committees (UPMRC); Barghouti's face had been burned out of the picture by the Israeli soldiers. Across the hall from PNGO was the Palestinian Farmers' Union office, and the Israelis had spray-painted a message on the door in Hebrew: "Keep it clean." Throughout the building other offices—nearly all of them belonging to humanitarian and citizen organizations similar to PNGO—had been broken into, ransacked, and left a shambles. 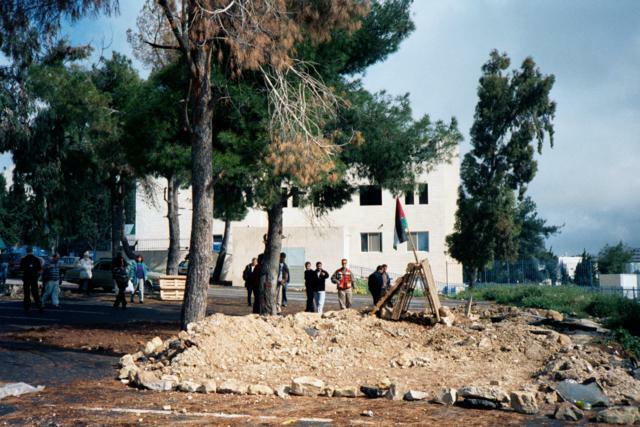 These were not military targets or part of any "terrorist" support structure; they were part of the civilian infrastructure of Palestinian society. It was clear that the Israeli attack had not made any such distinction, and in fact had intentionally targeted many of the core components of Palestinian civil society. Near the top of the building was the Al Watan television station. I had heard reports in the Australian press of Israeli soldiers broadcasting pornographic videos to the people of Ramallah, and the technicians at Al Watan said that this was the station where it had happened; several people I spoke to verified that they'd seen the videos themselves. The Israelis had also used the station as a sniper post—I could see the holes they had broken in the outer windows for their rifles. Al Watan was on one of the upper floors of the building, so it provided the perfect vantage point for the snipers. The hospital was just across from the building, and the thought crossed my mind that perhaps these same snipers had killed the woman I'd heard about the night before. We took a taxi back toward Jerusalem. The taxi dropped us off at the Kalandia checkpoint, on the outskirts of Ramallah; it would go no further. As Americans and Europeans, we could have been waved through the checkpoint quickly, but we decided to wait in line with the Palestinians instead. There was no shade and the hot late-morning sun was beating down on the crowd. The checkpoint was constructed mainly out of concrete blocks, concrete barriers and barbed wire. An Israeli APC was parked nearby. Some Israeli soldiers stood behind large blocks of concrete piled high with sandbags, their machine guns trained on the crowd, while others worked up nearer the Palestinians themselves. 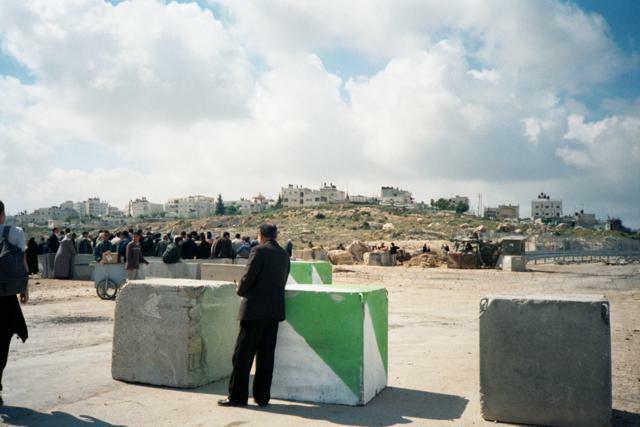 The Palestinians stood in about a dozen lines formed by the barriers, waiting for the Israeli soldiers to call them up one at a time. For long stretches the soldiers would just stand there, talking and smoking, calling nobody at all. The lines inched forward slowly. As we waited we spoke to a Palestinian man in the line who told us how he had once had to come through Kalandia to take his son to a hospital in Jerusalem. His son had difficulty breathing, and he needed to get to a respirator—but the Israelis would not let them through. The man was trapped there for hours, worried that his son may die, before he was finally able to get through. Again, this awful story was by no means unusual; human rights groups (both international and Israeli) have documented countless similar incidents for decades. Palestinian ambulances are regularly barred from passing through the Israeli checkpoints. Pregnant women are frequently denied passage to go to hospitals, and so instead they are forced to give birth in the dirt at the checkpoint itself; without proper facilities or medical care, the infants often die. Checkpoints are not just a way station or a minor inconvenience for Palestinians: they are a constant presence, a primary consideration in nearly every travel plan (no matter how minor), and a matter of life and death. The Palestinians in the West Bank and Gaza spend hours of their day simply waiting to get from one Palestinian area to another, completely at the mercy of the Israelis. This is the everyday face of the occupation.